GOAL: To create a gentle acne soap. I do NOT make any claims to its effectiveness in combating acne. However, this soap should make your skin feel and look a bit better. This soap is made using the method of water reduction to speed saponification and cure. Soap could be ready for use within 1 week, however I do recommend longer cures for better lather. This method requires meticulous measuring and timing. It is also imperative that good safety measures be taken as you are making stronger lye solutions which are much more potent and quite vicious to live tissue. If you are more comfortable with weaker lye solutions, then triple the amount of water given in the recipe. 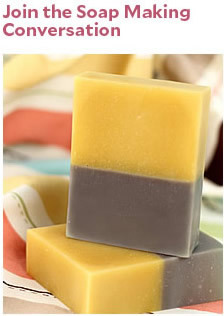 This recipe uses the gentle purifying qualities of lavender and the antiseptic properties of niaouli (tea tree family) to help deal with break-outs. Grapeseed has astringent qualities, and will provide lively bubbles in combination with olive oil. Your base ingredients – 1500g batch – 12 bars approx. 1. Add lye to very cold water and whisk gently and constantly until solution is clear. Let cool to 90ºF. 3. Make a slurry of the clay and essential oils. Use about 1/2 oz of your olive oil to make a smooth slurry. 4. Add the lye solution to the base oils with your stick-blender whirring away in the oils. Alternate between hand whisking and the stick blender until trace. At medium trace, add your EO slurry. Mix very well. 6. Unmold and cut 12 hours after pouring. 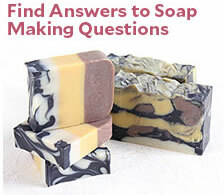 Soap should be smooth and fine-grained. If using more water, wait about 18 hours before unmolding and cutting. Enjoy! !